The department has a broad range of international collaboration on a project basis with laboratories in many countries both within and outside Europe (incl. Africa, America, Asia and Australia). Several scientists also have active roles in various governing bodies, expert committees etc. of national and international research organisations including e.g. the World Health Organisation (WHO), the Global Alliance for Vaccines and Immunisation (GAVI), the International Vaccine Institute (IVI), and EU programs. Several projects have collaborative links with the pharmaceutical and/or biotechnology industry. 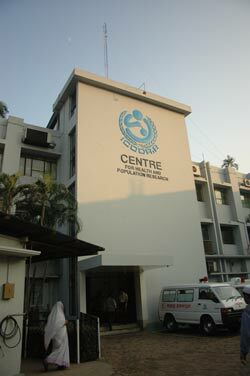 An important collaboration partner is ICDDR,B – Centre for Health and Population Research, Dhaka, Bangladesh. Read a SASNET Report from a visit to ICDDR,B in December 2005. Several of the researchers are connected to the Mucosal Immunobiology and Vaccine Center (MIVAC) at Göteborg University, a strategic research center that as existed since 2005, with financial support from the Swedish Foundation for Strategic Research. Director for MIVAC is Professor Nils Lycke. The overall aim of the center is to foster basic and applied science in the field of mucosal immunobiology and vaccine development. MIVAC represents an important effort to bring together a critical mass of highly renowned research groups in one geographical location to expand Swedish international scientific excellence in the field. An important asset to MIVAC is the ability to take advances in pre-clinical research to clinical testing and commercial exploitation together with our group of collaborating industrial partners. The center has 19 research groups comprising 120 people at all academic levels with expertise in basic immunology, cell biology, protein chemistry, glycobiology, gastroenterology, microbiology and vaccinology. • Cholera toxin, mucosal immunity and development of mucosal vaccines and immunotherapies. Group leader: Jan Holmgren. More information. • NK cells and Regulatory T cells in Helicobacter pylori infection. Group leader: Samuel Lundin. More information. To provide better resources and a clearer identity for its vaccine research, Göteborg University has also, with financial support from the Knut and Alice Wallenberg foundation, established a specific vaccine research institute, GUVAX – Gothenburg University Vaccine Research Centre. GUVAX focuses on vaccine development against selected mucosal infections; research to develop anti-immunopathological vaccines/immunotherapies against autoimmune and allergic diseases based on mucosally induced tolerance; and research to develop therapeutic vaccination strategies against certain forms of cancer. An important generic research line is the elucidation of cells and mechanisms involved in steering the mucosal immunization outcome towards immunity or tolerance and the development of immunomodulating adjuvants for such purposes. GUVAX collaborates actively with many research groups and units in Sweden and abroad, including active collaboration with many international organisations and institutions engaged in vaccine research, not the least ICDDR,B – Centre for Health and Population Research in Dhaka, Bangladesh. GUVAX has been headed by Prof. Jan Holmgren (Director) and Prof. Svennerholm (Associate Director). 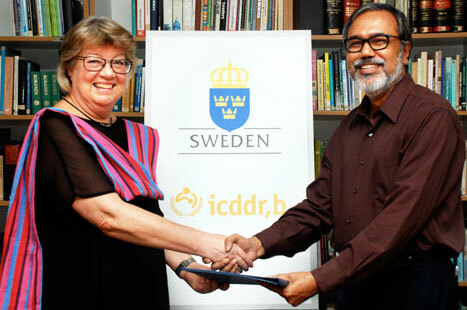 In October 2012, representatives of the Swedish International Cooperation Agency (Sida) and icddr,b signed an agreement that will provide icddr,b with SEK 54 million ($8 million) of institutional support and project funding over the period 2013-15. On photo: Karin Rohlin, Head of Development Cooperation & Deputy Head of Mission at Swedish Embassy in Dhaka, and icddr,b’s Interim Executive Director, Dr. Abbas Ghuiya, sign the agreement. For almost 30 years, Sida has served as one of icddr,b’s core donors, providing consistent financial support–both unrestricted funds and project funds. Sida’s support has enabled icddr,b to develop low-cost solutions to the health problems that affect billions of people living in poverty in Bangladesh and across the world. icddr,b’s competencies undergird Swedish interest in public health knowledge generation of global or regional significance, and in building research capacity in developing countries for pro-poor health research. In Sweden researchers especially at University of Gothenburg, Uppsala University and Karolinska Institutet have been involved in research collaboartiion projects with icddr,b. Sida project funding has supported research in a wide array of areas, including, among others: immunology and microbiology research in the areas of enterotoxigenic E. coli (ETEC) and in the surveillance for virulence antigens; interventions to improve immunogenicity oral enteric vaccines – cholera and typhoid vaccines; production cost estimation of child healthcare services in Bangladesh; health systems research examining effect of post-menstrual regulation family planning counseling on subsequent fertility and family planning method use. Sida played a vital role in icddr,b’s zinc research aimed at mitigating diarrhoea in children under five. For example, long-term, Sida-supported research led to the discovery that zinc when taken with ORS further reduces fatality rates from diarrhoea, as well as the severity and likelihood of hospitalisation during future diarrhoeal episodes. Beginning 2004, WHO and UNICEF recommended use of the ORS-zinc approach in treating acute diarrhoea globally. The other significant area where Sida’s unrestricted funds have played a critical role is in maintaining and improving core infrastructure, such as the surveillance systems, healthcare facilities and field sites. The Health and Demographic Surveillance System (HDSS) at icddr,b’s Matlab field site is the longest continuously running longitudinal data resource in the developing world, monitoring over 225,000 people. It is a model for the global INDEPTH Network, which works to strengthen research capacity in low- and middle-income countries to use HDSS to inform health policies. Matlab and its data continue to be an invaluable resource in understanding underlying trends and factors important for designing and developing policies, strategies and intervention programmes. Read more about the Swedish institutional support.. Professor Jan Holmgren (photo) and Dr. Michael Lebens run an extensive project entitled ‘A Novel Effective Vaccine against Cholera, funded by a speactacular research grant from Bill & Melissa Gates Foundation in 2009. They were among 76 recipients of a Grand Challenges Explorations grant. This is a five-year, $100 million initiative to promote innovation in global health. It is part of the Grand Challenges in Global Health initiative, which is supported by the Gates Foundation to achieve major breakthroughs in global health. For their project they received a grant worth USD 100 000 per year for a five years period – with a chance of receiving another USD 1 m grant one year later. Read more. The aim for the project is to produce an effective protection vs. cholera, based on creating a new species of bacteria. It will contain all the components in the drinkable Dukoral vaccina alredy existing, plus new ingredients. The ambition is also to make production cheaper and the rate of protection higher so that one vaccine treatment will be sufficient. Today, Cholera is a disease that kills approximately 100,000 people a year all over the world. Read more in an interview with Prof. Holmgren. On 3 November 2015, The Swedish Research Council decided upon Development Research grants, the ones previously distributed by the Swedish International Development Cooperation Agency (Sida). One of the grants was given to Prof. Jan Holmgren and his research team consisting of Michael Lebens, Stefan Karlsson, and Manuela Terrinoni. The total amount is SEK 3.255 m for a three year period (2016-18). The project is entitled ”Development of an Improved, Single-strain, Locally Produced Oral Cholera Vaccine”. 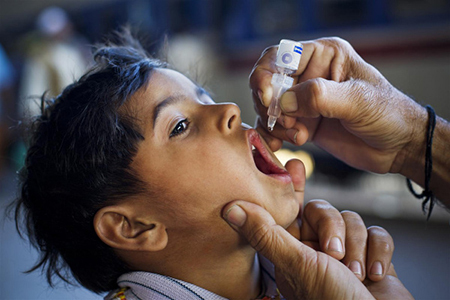 Project Abstract: The research group has previously been deeply involved in the development of the internationally available, closely related oral cholera vaccines (OCVs) Dukoral® and Shanchol®. These vaccines are effective, but the use of several strains and two inactivation methods make their manufacture complex and relatively expensive, and OCVs are therefore still severely underused globally. In developing a new generation of OCVs, a central aim is to make it affordable for the populations in greatest need. This can be achieved by simplifying manufacture whilst maintaining the levels of protection afforded by currently available OCVs. Using a single vaccine strain and one inactivation method would considerably simplify and reduce the cost of manufacture. The research group has recently developed a novel concept and also engineered a new type of vaccine strains for such a new generation of OCVs, whereby the several V. cholerae O1 components in Dukoral and Shanchol can be replaced by a single-strain/single-formulation component with full retention of protective immunogenicity. The team now proposes, in collaboration with partners in India and Bangladesh, (1) to develop this novel single-strain OCV prototype into a truly low-cost, and also thermo- and pH-stable vaccine formulation for worldwide use including stockpiling purposes. A first-generation of the new OCV is planned to go into clinical testing in Bangladesh in 2016 with product approval hoped for already in 2018. In parallel, (2) the researchers will also develop a second-generation OCV formulation, which by including a novel cholera-toxin-derived mucosal adjuvant may provide adequate protection after single-dose administration, a feature which would be especially valuable for use in cholera outbreaks. Professor Ann-Mari Svennerholm is leader of a research group working on a project titled “Infection and immunity studies of ETEC and Helicobacter pylori“. Other members of the group have been Dr. Anna Lundgren, Dr. Joshua Tobias, Dr. Åsa Sjöling (more information), Dr. Matilda Nicklasson (more information), and the PhD candidates Tafuiq Bhuiyan, Anders Janzon, Claudia Rodas, and others. Project abstract: Enteroxigenic Escherichia coli (ETEC) is the most common cause of diarrhea in developing countries and in travelers to these areas. We study the prevalence of such bacteria and their virulence factors in different countries and populations, using specific monoclonal antibody and molecular diagnostic methods (e.g. gene probes and PCR). We also analyze the expression of different ETEC virulence factors during clinical infection as compared to during growth in vitro, and we try to identify protective immune mechanisms against ETEC both in animal studies and by studying infections and re-infections with ETEC in birth cohort studies, e.g. in Bangladesh. Work is also in progress to develop an effective ETEC vaccine. Studies are in progress to evaluate the influence of different nutritional factors including breastfeeding for vaccine efficacy. These studies are conducted in close collaboration with scientists in different developing countries, e.g. in Bangladesh, Egypt, Guatemala, Mexico and Bolivia. Since H. pylori is one of the most common gastrointestinal infections that primarily infect young children, in particular in developing countries, we are studying infection with these bacteria and development of immune responses during the first years of life in a high endemic area. This includes studies to evaluate the role of maternal immunity and also if protective immunity can develop in young infants that may explain spontaneous eradication. We are also comparing mucosal immune responses in Swedish and Bangladeshi asymptomatic carriers and duodenal ulcer patients as a background for development of an H. pylori vaccine that can be used worldwide. In October 2012, Prof. Svennerholm, together with research partners Associate Professor Anna Lundgren, and Dr. Joshua Tobias, was granted a project grant from the Swedish Research Council of SEK 4.95 m in three years, 2013-15, for continued research on vaccines against e-coli and heliobacter. The name of the project is “Studies towards development of vaccines against ETEC and H. pylori for use in developing countries“. More information on the Swedish Research Council Grants for South Asia related projects in 2012. Project abstract: The overall aim of this project is to develop effective vaccines against two of the most common gastrointestinal pathogens, i.e. 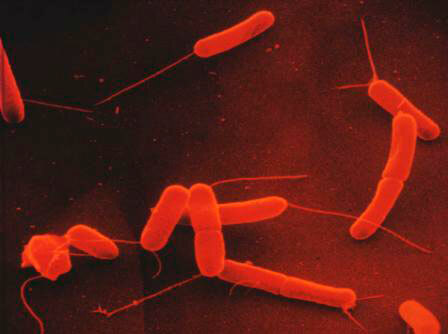 enterotoxin-producing Escherichia coli (ETEC) and Helicobacter pylori, especially for use in developing countries. This includes studies to elucidate immune mechanisms and antigens of importance for protection against diseases caused by these bacteria and to construct and evaluate promising candidate vaccines for safety and immunogenicity, initially in animals and subsequently in humans. It also includes a search for new ETEC colonization factors and analyses of emerging ETEC clones by means of whole genome sequencing. A new oral ETEC candidate vaccine developed by us, consisting of recombinant E. coli bacteria over-expressing the most important ETEC colonization factors and a toxoid will be evaluated alone and together with a promising mucosal adjuvant for safety and immunogenicity in Phase I/II studies, initially in Sweden and subsequently in descending age groups in Bangladesh. The aim is also to identify simple interventions such as calorie and micronutrient supplementation, changed breast feeding patterns, anti-parasite treatment that may improve immune responses against enteric vaccines in children in developing countries. Vaccine strains that overexpress putative protective H. pylori antigens will also be constructed and tested for protective efficacy in experimental animals. In November 2013, the Swedish Research Council decided to give Professor Ann-Mari Svennerholm SEK 3.250 million as a three-year (2014-16) U-forsk grant for a project entitled ”Evaluation of a Vaccine against EHEC for use in low- and middle income countries”, to be carried out in collaboration with Dr. Firdausi Qadri (photo), Director of the Centre for Vaccine Sciences at International Centre for Diarrhoeal Disease Research, Bangladesh (ICDDR, B), Dhaka. More information about the South Asia related U-forsk grants 2013. Till 2011, the U-forsk (developing country research) grants programme was administered by the Swedish International Development Cooperation Agency, Sida, but it has now been taken over by the Swedish Research Council. The aim is to establish and maintain a knowledge base of relevance to aid and development issues, plus capacity for developing country research in Sweden. Individual researchers or groups of researchers working at universities/colleges or other research institutions in Sweden have been able to apply for a grant. Swedish citizens working at the Scandinavian Institute for Asian Studies (Nordiska Asieninstitutet, NIAS) in Copenhagen have also had the opportunity. More information. Abstract: The overall aim of this project is to develop an effective vaccine against one of the most common intestinal pathogens, i. e. enterotoxin-producing Escherichia coli (ETEC), especially for use in low and middle income countries, A new oral candidate vaccine developed by us, consisting of four recombitant strains of E. coli bacteria over-expressing the most important ETEC colonization factors and a toxoid (LCTBA) given alone and together with a mucosal adjuvant, dmLT, is presently evaluated for safety and immunogenicity in adult Swedish volunteers with promising preliminary results. We now plan to evaluate this vaccine in different dosages for safety and imunogenicity in Phase I/II studie in descending age groups; adults, children 2-5 years, and young children and infants 6-23 months, in Bangladesh. The project also includes establishment of new methods and determination of optimal time points for assessing mucosal immune responses against the key antigens of the vaccine, in an immunologically primed population. We will also try to identify factors that may explain factors that may explain the lower efficiacy of oral vaccine in children in developing countries and based on this identify interventions that may improve immunogenicity in this important target group. Professor Ann-Marie Svennerholm has also been involved in a research project on ”Gastrointestinal infections, water and health”. The research group also included Dr. Ingrid Bölin, Dr. Åsa Sjöling, and the PhD candidates Anders Janzon and Åsa Lothigius. Project description: The purpose of this project was to identify environmental and ecological factors that may facilitate spread of waterborne gastrointestinal infections, i.e. enterotoxigenic E. coli (ETEC), Vibrio cholerae and Helicobacter pylori, both in developing and developed countries. To achieve this goal we will develop suitable methods for identification of the causative bacterial pathogens in water samples and identify different environmental conditions that may promote/counteract contamination of different water sources with these pathogens as well as their transmission and capacity to induce severe diseases both in populations in industrialized and in developing countries. This project was a multidisciplinary project and it is part of an international network for ”Research and education in infectious diseases, water and health” with professor Rita Colwell, University of Maryland, USA, Dr Firdaus Qadri, International Centre for Diarrheal Disease Research (ICDDR, B), Dhaka, Bangladesh and Dr. Bodil Hernroth, Kristineberg Marine Research Station, the Swedish Royal Academy of Science, and others. Abstract: Enterotoxigenic Escherichia coli (ETEC) and Helicobacter pylori (Hp) are common infections in low- and middle-income countries (LMIC). ETEC gives rise to watery diarrhea, causing 400 000 deaths/year, primarily in young children. LMIC children are also often chronically infected with Hp and in 15-20% of cases, the infection causes symptoms later in life such as peptic ulcers or gastric cancer. Our recent results suggest that CD4+ T helper cells, particularly those that secrete the cytokine IL-17A (Th17), play important roles in promoting protective immune mechanisms in both infections. The overall aim of this project is to advance the knowledge we have recently gained on Th17 responses in different model systems to human ETEC and Hp infection. This includes (I) to characterize T helper cell responses to these infections in humans and (II) to study the functional capacity of novel mucosal vaccine adjuvants to enhance human CD4+ T helper cell responses. This collaborative project, performed at the University of Gothenburg and the International Center for Diarrhoeal Disease Research, Bangladesh, will benefit from the combined expertise of the applicants, including broad knowledge in techniques for analyzing T cell responses and extensive experience of studies of mucosal immunity in LMIC. The project also aims to establish a framework for mutual learning and training of PhD students and younger scientists at both sites, forming a basis for extended future collaboration. On 4 November 2014, Associate Professor Sukanya Raghavan was granted a development research grant from the Swedish Research Council (total amount SEK 4.4 m in four years, 2015-18) for a project entitled ”Development of a mucosal vaccine against Helicobacter pylori infection including Phase I clinical testing in India”. Listen to Sukanya informing about the project on web-tv. Project abstract: Gastric Helicobacter pylori infection is the main cause of peptic ulcers and gastric cancer. Remarkably, an estimated 80-90% of the adults in low and middle income countries are infected with H. pylori. An estimated 10-15% of the infected individuals will develop peptic ulcer disease and 1-2% gastric cancer. Antibiotic treatment can cure peptic ulcer disease but reinfection is common. From a public health perspective, a vaccine against H. pylori will reduce the consumption of antibiotics, the incidence of associated symptoms and rate of reinfections. The main target group for such a vaccine would be adults in low and middle income countries where H. pylori infection is endemic. Our group at the University of Gothenburg (UG) has been working for the last 20 years on the development of a mucosally delivered vaccine against H. pylori infection. Based on the results from our pre-clinical studies, a vaccine candidate will be chosen to advance to Phase I clinical trials in H. pylori infected adults and later in children in close collaboration with an industrial partner. The vaccine will be scaled up for production under GMP conditions. Pre-vaccine specific immune responses in H. pylori infected individuals in India will be studied and a Phase I trial will be carried out in India. Considering the previous experience at UG in developing mucosal vaccines, we are optimistic that we could develop an effective and low-cost H. pylori vaccine under the framework of this application. More information about South Asia related Swedish Research Council grants 2014. Dr. Raghavan defended her PhD at the department in 2002m spent some years elsewhere but is back at Sahlgrenska since 2007. Anna Lundgren and Sukanya Raghavan participated in a meeting with SASNET deputy director Lars Eklund at Sahlgrenska Academy on 24 January 2015. Read a report from the meeting. Currently (2015), two Bangladeshi PhD candidates are based at the department. They are Marjahan Akhtar and Sarmin Akter. Both of them come from ICDDR,B in Dhaka. Professor Jan Holmgren has carried out research on cholera for more than 30 years. His interest for the cholera bacteria was originally raised by his predecessor as professor, Örjan Ouchterlony. On a shocking visit to what is now Bangladesh in 1969/70 he was reminded of the severe cholera epidemics that flourished in Asia and Africa. The department decided to set aside resources for this kind of research. Along with the then new PhD candidate Ann-Mari Svennerholm Holmgren (now also professor at the department), Jan Holmgren could finally after several years of research and tests performed in Bangladesh 1970–81 be able to present an effective oral vaccine countering cholera. Another clinical field test was carried out in collaboration with the ICDDR,B in Bangladesh in 1985–88. Approximately 90 000 people were involved in the test study which gave a positive result. The vaccine, registered in 1993, is nowadays widely manufactured by the pharmaceutical industry under the name Dukoral. 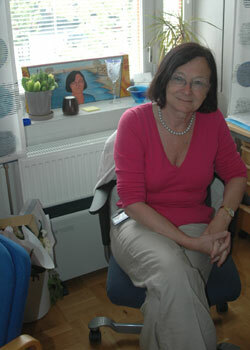 The prestigious Nordic Fernström Prize for outstanding performances in Medicine for 2004 was awarded to Prof. Holmgren. The prize delivered by the Faculty of Medicine at Lund University, Sweden, was given to him for his research on cholera resulting in an effective vaccine. Jan Holmgren received the award at a ceremony at Lund University on Wednesday 3 November 2004. Professor Holmgren has later been involved with the research project ”Cholera, mucosal immunity and development of mucosal vaccines and oral tolerizing agents”. Project description: The project adresses central problems in mucosal infection, immunity and vaccine development: 1. Mechanisms of disease and immunity in cholera and other enteric infections and development of protective vaccines. 2. Mucosal immunity and vaccine development against respiratory and genital tract infections. 3. Mucosal vaccines by coupling or gene-fusing specific antigens/epitopes to the cholera toxin B-subunit (CTB). 4. Methods for inducing specific immunological tolerance (”mucosal tolerance”) and development of specific immunotherapies (”anti-inflammatory vaccines”) for use in autoimmune diseases, transplantation, allergies, and immunopathologic complications to infections.In October 2006, Prof. Holmgren received SEK 1.2 million as a two-years grant from Sida’s Developing Country Research Council for a project titled ”Development of an oral vaccine protecting against both O1 and O139 cholera”. More information about Sida’s 2006 grants. Earlier in 2006 Prof. Holmgren also received SEK 1.4 million as a two-years grant from Sida’s Support to HIV/Aids research programme, for a project titled ”Role of infant feeding peer counsellors in prevention of mother-to-child-transmission of HIV”. More information. Results from research carried out in Bangladesh (supported by grants from Sida/SAREC and the United States Agency for International Development, USAID) were published in the journal Vaccine in October 2005. The article is entitled ”Reduced doses of oral killed enterotoxigenic Escherichia coli plus cholera toxin B subunit vaccine is safe and immunogenic in Bangladeshi infants 6-17 months of age: dosing studies in different age groups”, and was authored by Ann-Marie Svennerholm in collaboration with Dr. Tahmeed Ahmed; Firdausi Qadri; F. Ahmed; Y.A. Begum; and Prof. David Sack, all researchers based at ICDDR,B in Dhaka, Bangladesh. Read a summary of the research results. Earlier, during the 1990s Prof. Svennerholm was also involved in a research collaboration with Indian, European and Guinean universities, studying ETEC and EAEC-Agg surface proteins, developing diagnostic methods and participating in epidemiological studies of childhood diarrhea in India and Guinea Bissau. In India the collaboration partner institution was the Department of Pediatrics, All India Institute of Medical Sciences, New Delhi. A Sida/SAREC grant in 2001 resulted in a study jointly by ICDDR,B and Göteborg University on ”Enterotoxigenic Escherichia coli and Vibrio cholerae Diarrhea, Bangladesh 2004 ”, presented in an article the Emerging Infectious Diseases journal, no 7/2005. Read an abstract. In 2003 the Division received SEK 1.05 Million as a three-years project grant from Sida/SAREC for the project ”Comparision of Immune responses against Helicobacter pylori in developed and developing countries as a basis for vaccine development”, to be carried out in Bangladesh. The researchers involved in the project were besides Ann-Marie Svennerholm also PhD Samuel Lundin, PhD candidates Anna Lundgren and Erika Strömberg, and finally Professor Lars Engstrand at the Dept. of Clinical Bacteriology, Uppsala University. Previously Dr. Michael Lebens was the leader of a research group working on the project ”Recombinant fusion proteins based on cholera toxin B subunit for the prevention and treatment of autoimmune disease”. Other members of the group included Prof. Jan Holmgren, and the PhD candidate Johan Wiman. In 2003 Sida/SAREC gave SEK 1.05 Million to the project as a three-years grant. More information Sida/SAREC grants 2003. Project desription: Inflammatory autoimmune responses directed against human 60 kDa heat shock protein (HSP60) have been implicated in a number of important autoimmune diseases. For some of these, intervention therapy aimed at tolerance induction or immune deviation from a Th1 to a Th2 dominated response has had positive effects on the progression of the disease. Notably in type 1 diabetes a single HSP60-derived peptide (p277) has been used to immunize patients with early symptoms . A second disease in which a specific HSP60 peptide has been identified as having a role in pathology is Behcet’s syndrome. In this multisystem inflammatory disorder the major manifestation is uveitis. Disease activity is correlated with T cell proliferative responses to the HSP60 peptide p336-351. The same peptide, chemically coupled to cholera toxin B subunit (CTB), could suppress development of experimentally induced disease in Lewis rats and in a limited clinical trial, significantly reduce symptoms in Behcet’s patients. The aim of the work was therefore to develop CTB fusion proteins for the treatment of autoimmune diseases as we have previously done in schistosomiasis liver inflammation. A number of proteins have been constructed and purified carrying epitopes from proteins implicated in different inflammatory diseases. Among these are HSP60-derived peptides (including p336-351) and two fusion proteins derived from low density lipoprotein (LDL), a protein implicated in development of atherosclerosis . One of these LDL fusion proteins has been shown to be active in reduction of aortic plaque size in ApoE null mice and the proteins serve as good examples of the advantages and disadvantages of this technology. Further work aimed at developing novel methods for identification of active T cell epitopes from proteins implicated in the development of different autoimmune diseases. Dr. Firdausi Qadri from the Laboratory Sciences Division at ICDDR,B in Dhaka, participated in the Sixth Global Vaccine Research Forum, held in Salvador da Bahia, Brazil, 12–15 June 2005. In a panel about ”New vaccines against Shigella and ETEC”, Qadri made a presentation about the global ETEC disease burden. Abstract: Enterotoxigenic E. coli (ETEC) is a common cause of watery diarrhoea in all ages, in particular in children one to four years of age. It is estimated to cause some 280 million episodes of disease and some 400 000 deaths annually. Moreover, it is believed to account for some 20–25% of all cases of diarrhoea in children, and up to 40% of cases of traveller diarrhoea. Repeated episodes of disease in children are associated with long-term morbidity, manifested by malnutrition and growth faltering. Global prevalence of ETEC in diarrhoeal patients has been demonstrated in case–control studies. However, ETEC isolated from patients in various geographic areas differ by toxin profile. Isolates produce either heat labile toxin or heat stable toxin (ST) or both (LT/ST); in addition more than 25 colonizing factors (CF) have been identified. More than 100 different ETEC O-antigen serogroups can be differentiated, out of which some seven to eight are common, and this diversity has hampered inclusion of O antigens in the vaccine development pipeline. In Bangladesh, ETEC disease burden studies have been conducted in conjunction with studies on V. cholerae. Birth cohort studies of natural ETEC infection at Mirpur field site revealed some 6.6 diarrhoea-days per child and per year, and a prevalence of ETEC diarrhoea of 19%, higher than for any other enteric pathogen isolated from diarrhoeal stools. Stratification by hospital and community setting, however, shows the highest prevalence of rotavirus in hospitalized cases, whereas ETEC remains highest in community cases, pointing towards greater severity of rotavirus disease. Prospective data has revealed that, at least for some CFs, protection is conferred against symptomatic reinfection with ETEC expressing the homologous CF. ETEC can be a major cause of watery diarrhoea in disease epidemics associated with flooding, and the environment has been established as a critical source for perpetuation of ETEC infections. Increased antimicrobial resistance has been observed in ETEC isolates with some 50% of isolates being resistant to ampicillin and 16% to cyprofloxacin. Other control measures, in particular improved sanitation and vaccines, are thus urgently needed. Prof. Svennerholm was interviewed by the Swedish newspaper Dagens Nyheter and an article published on 19 March 2005. It written by the journalist Gunilla Eldh and focused on the research work on vaccine development in Bangladesh. Read the article, titled ”En världsmästare på vaccin”. In November 2005 Prof. Svennerholm received SEK 300 000 as continued funding for the year 2006 from Sida/SAREC, for a project titled ”Development of an ETEC vaccine for use in infants in developing countries”, and one year later, in Nov. 2006, she got another SEK 600 000 as an extension with two years for the same project. More information about Sida’s 2006 grants. In November 2006 Prof. Svennerholm also received SEK 1 410 000 as a three-years (2007-09) project grant from the Swedish Research Council for a project titled “Development of vaccines against ETEC and Helicobacter pylori“. Read the abstract (in Swedish only). In November 2009, Prof. Svennerholm was awarded SEK 1.2 m as a three-years research grant (2010–12) from the Swedish International Development Cooperation Agency, Sida, for a a new project entitled “Improving Immunogenicity of Oral Vaccines in Children in Developing Countries“. More information about the 2009 Sida grants. PhD Matilda Nicklasson defended her doctoral dissertation titled ”Studies on the expression and regulation of enterotoxins and colonization factors in enterotoxigenic escherichia coli (ETEC)” on Thursday 31 January 2008. The results are based on studies of ETEC bacterias from patients at the International Centre for Diarrhoeal Disease Research (ICDDR,B) in Dhaka, Bangladesh. Abstract: Enterotoxigenic Escherichia coli (ETEC) is one of the most common causes of acute watery diarrhoea in developing countries, particularly among local children less than five years and is also the most common cause of diarrhoea in travellers to ETEC enemic areas. The infection is transmitted by ingestion of contaminated food and water and the disease is established in the small intestine Colonization factors (CFs) on the bacterial surface mediate adhesion to the intestinal epithelium and diarrhoea is manifested by the actions of a heat-stable (ST) and / or a heat-labile (LT) enterotoxin. Two of the most common CFs in strains isolated world-wide are coli surface antigens 5 (CS5) and 6 (CS6). In this thesis the expression and regulation of these important virulence factors as well as the genetic variability among ETE strains have been studied. More information. In November 2008, Dr. Nicklasson was awarded SEK 600 000 as a one-year grant from Sida/SAREC’s Developing Country Research Council for a project titled ”Molecular epidemiology of enterotoxigenic Escherichia coli (ETEC) in the context of virulence, patient group, spread, and seasonality in Bangladesh”. In October 2010, she was again awarded a grant from Sida/SAREC’s Developing Country Research Council, this time SEK 1 m for a project over two years (2011-12). The project, in reality a continuation of her earlier research focusing on Bangladesh but this time extending the project also to other countries, is entitled ”Transmission, infection patterns, and antibiotic resistance profiles of enterotoxigenic Escherichia coli (ETEC) in Asia, Africa and Latin America”. More information. The main collaboration partner on the Bangladeshi side was Dr Firdaus Qadri at ICDDR,B. Project abstract: According to the World Health Organization (WHO), acute infectious diarrhoeal disease is the number two killer of children living in developing countries, accounting for approximately one-fifth of all deaths in children under the age of five every year. One of the most common causes of acute diarrhoeal disease among children and adults in developing countries is Enterotoxigenic Escherichia coli (ETEC), which causes an estimated 400 million diarrhoeal cases and up to 400 000 deaths in young children every year. ETEC produce two main groups of virulence factors; colonization factors (CFs) and enterotoxins (ST and/or LT). This project will investigate the global transmission, infection patterns, and antibiotic resistance of ETEC strains in different parts of the world in order to facilitate the design of appropriate intervention and prophylaxis measures. More specifically, the aim is to study the genetic variability, infection patterns and antibiotic resistance of ETEC from several countries in Asia, Africa and Latin America, focusing on emerging toxin/CF profiles. The genetic findings and antibiotic resistance profiles will be correlated to severity of disease, patient age, seasonality, and socioeconomic factors. Better means of controlling the transmission of ETEC may decrease childhood mortality, and may result in an improved nutrition status of children in developing countries by decreasing the number of childhood diarrhoeal episodes per year. The results of the project may also lead to increased understanding of the transmission of antibiotic resistance among ETEC strains, which is important in developing countries where extensive antibiotic resistance is common. PhD Tanvir Ahmed, another member of the research group, defended his doctoral dissertation titled ”Vaccination against cholera and ETEC diarrhea and interventions to improve vaccine immune responses” on 10 June 2009. Dr. Ahmed is working at ICCR,B in Dhaka. Abstract: Vibrio cholerae O1 and enterotoxigenic Escherichia coli (ETEC) together account for the majority of bacterial causes of acute dehydrating diarrhea in children in Bangladesh. Vaccines should be considered as an important public health tool for prevention of these diarrheal diseases. The results of Dr. Ahmed’s studies give important background information regarding the possibility of inducing effective immune responses to oral inactivated enteric vaccines in young children in developing countries. More information. PhD Åsa Sjöling worked on a project entitled ”Expression of virulence factors in enterotoxigenic Escherichia coli (ETEC) during infection (in vivo)”, together with Prof. Ann-Mari Svennerholm and Dr. Matilda Nicklasson. She is now based at Karolinska Institutet in Stockholm. Abstract: The gastrointestinal pathogen enterotoxigenic Escherichia coli (ETEC) colonises the human intestine and causes severe diarrhoea by the secretion of toxins. This project aims at identification of the environmental factors that regulate virulence during infection. We are identifying conditions that promote toxin production and secretion by analysis of gene expression and protein production. The obtained results are compared to the expression in ETEC derived directly from patient stool samples. The ultimate goals are to identify the molecular mechanisms that regulate virulence in ETEC and to identify potential vaccine candidate antigens expressed on the surface of ETEC during infection of the human intestine. In 2005, Åsa Sjöling received a stipend to pay for two years of continued postdoctoral medical research, by the Swedish Association for Medical Research (Svenska Sällskapet för Medicinsk Forskning), for this project. Read about her research (in Swedish only). In June 2005 Dr. Sjöling also received SEK 675 000 as a two-years grant from the Swedish research council FORMAS for a project dealing with ”Detection of pathogenic viable but non-culturable bacteria (VBNC) in water, to identify transmission of infection in different types of water sources in Bangladesh”. More information about the project (only in Swedish). Earlier the same year, in June 2007, she received SEK 918 000 as another grant from Formas, for an application to the Joint Formas – Sida/SAREC grants for research on sustainable development in developing countries. The title of the project was ”Detection and charaterisation of pathogenic bacteria in water samples in Bangladesh in order to identify tools to improve household water procedures and avoid infection”. More information. PhD Stephen Attridge was leader of a research group working on the project ”Development of an improved cholera vaccine”. Other members of the group included Prof. Jan Holmgren, Prof. Ann-Marie Svennerholm, and PhD candidate Erik Nygren. In 2003 Sida/SAREC funded this project with SEK 500 000 for one year. Project description: The ultimate aim of this project is the development of a bivalent vaccine able to protect against the two Vibrio cholerae serogroups with demonstrated epidemic potential (O1 and O139). This is most conveniently achieved by preparing an inactivated vaccine against the O139 serogroup strains, and adding this to the present inactivated vaccine against V. cholerae O1. Initial attempts to prepare an inactivated O139 vaccine component have been discouraging, as the formulations’ immunogenicities and protective efficacies have been weaker than that of the analogous O1 component. We have derived panels of O139 variant strains with the aim of identifying one with improved immunogenicity, with respect to the induction of potentially-protective antibodies to O139 LPS. We are also attempting to develop a new cholera model, which would allow the direct evaluation of the protective efficacies of novel cholera vaccines. The vaccine research with large-scale field trials in Bangladesh has not been totally uncontroversial. A number of times over the years, criticism has been raised by individuals in Bangladesh against the project on moral grounds. In 2005, Mahmood Ali wrote an extremely critical article entitled ”What is for the ICDDR,B ?”n the Bangladeshi monthly bilingual webzine Megh Barta, 21 October 2005. Mahmood Ali is a medical doctor (MBBS), working since decades as public health & development expert, residing in Bangladesh. In July 2006, he wrote a new article containing sharp criticism against ICDDR,B – including for their vaccine projects. Read the article entitled ”A Performance Enhancing Drink For the US Military In Iraq”.